A full list of Easter Services being held at Castle Hill URC is available here. Castle Hill United Reformed Church, Ipswich is a modern, lively church located in the centre of Castle Hill, Henley Rise and on the doorstep of Whitton. The church was established in 1957 and its unique "tent-like" design and concrete construction is classified as Grade 2 listed. Castle Hill Church is part of the United Reformed Church. It is an active church with room for up to 150 people to attend the regular Sunday family worship, as well as a Sunday Club for children. 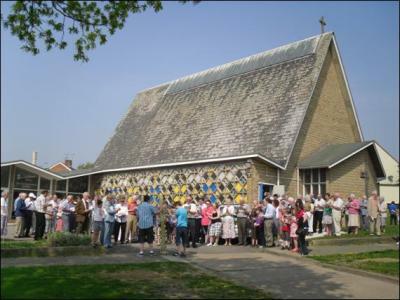 The church is part of the Ipswich and East Pastorate comprising Castle Hill, Felixstowe, Saxmundham and St. John's United Reformed Churches and has an active twinship with a church in Mussbach, Germany that results in annual exchange visits for family and youth groups. Please take time to browse our website and if you would like to visit us for one of our services you can be assured of a warm welcome. There are no strangers at Castle Hill - only friends. Family Worship is held every Sunday at 10.30 am. Please see the Services page for additional times.